Druse of very well defined crystals formed by the prism, the dipyramid and the terminal pinacoid. They are between transparent and translucent, are very bright and have a pale pink color. 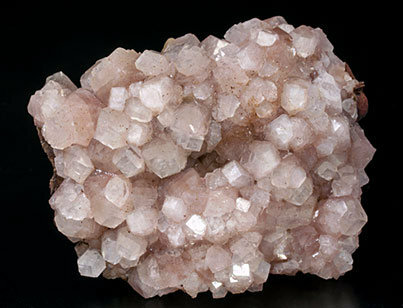 The N'Chwaning Mine is famous for its fine Rhodos but it also produces curious Hydroxyapophyllite-(K) specimens which are totally different from the Indian ones or any others for that matter. 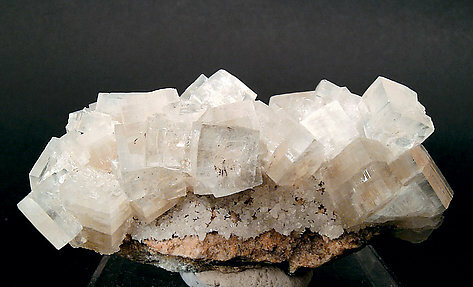 This esthetic group perched on its matrix displays very well due the extremely aerial position of the crystals.